Together, Corsearch and Darts-ip combine previously time-consuming work processes into a single comprehensive analysis. To evaluate risk, we integrate Darts-ip’s proprietary case law searches directly into each trademark record in the Corsearch Search reports and Watch notice. Accordingly, Corsearch and Darts-ip have created new efficiencies for the trademark practice and improve outcomes. This workflow enhancement is available at no additional charge for subscribers of both platforms. Instantly determine litigation risk while monitoring applications and publications Darts-ip uniquely provides global intellectual property structured case law data and tools. Now, the Darts-ip solution has been integrated into Corsearch Search and Watch to allow practitioners to obtain Darts-ip’s targeted and proprietary litigation searches driven directly from each record within the Corsearch platform. The trademark prosecution effort remains one of the most important areas of practice in protecting the rights and value of your clients’ brands. Similar goods and services are automatically highlighted in your search or watch. Therefore, practitioners will not have to review the entire list of goods and services for each cited mark. How often has a newly found mark been subject to litigation? The integrated tool verifies whether the newly found trademark has already been involved in a dispute and whether the dispute was from the same owner. How experienced is the owner? How often has the owner been party in cases? How often as defendant or as plaintiff? 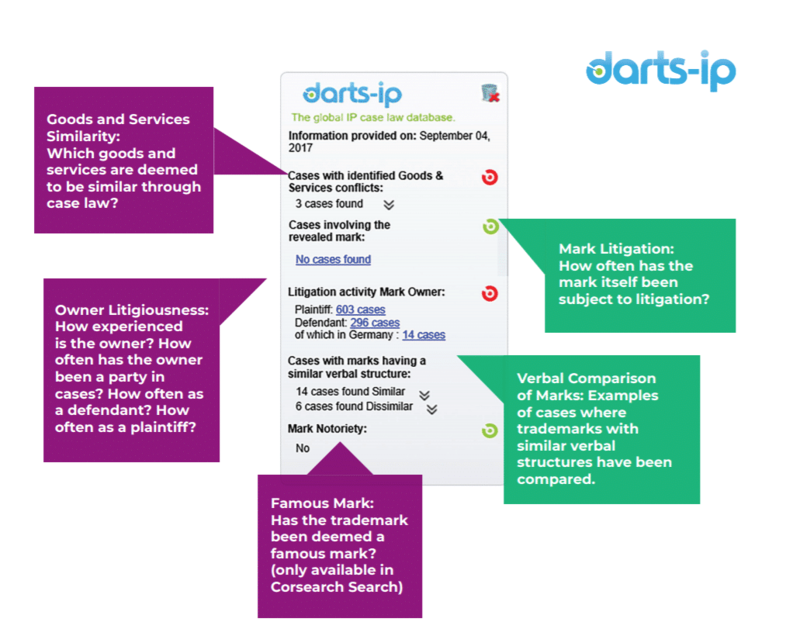 Owners of trade marks who are experienced prosecutors and litigators are highlighted, as Darts-ip provides the number of disputes where the owner specifically was a plaintiff or a defendant. To help you assess the risk of confusion between the mark searched or watched and the cited mark, we give you examples of cases where trade marks with similar verbal structures have been compared.